The Realising Just Cities programme at the University of Sheffield's Urban Institute is working with international partners to explore how cities are engaging with the United Nations Sustainable Development Goals (SDGs) and the New Urban Agenda. This project is funded through Mistra Urban Futures and also includes the cities of Buenos Aires (Argentina), Cape Town (South Africa), Gothenburg (Sweden), Kisumu (Kenya), Malmö (Sweden), Sheffield (UK) and Shimla (India). We have agreed a partnership with Sheffield City Council to explore the local relevance, interpretation and implementation of SDG goals, targets and indicators at city level, through pilot work applying the SDG framework to key local strategies and associated delivery plans. Based on the findings of this pilot, we will work with the Council to co-produce a forward plan for Sheffield's engagement with the SDGs. In-depth analysis is being carried out in each participating city by local researchers together with local authority partners, in parallel with a comparative component, with all cities involved in cross-city learning and interaction. This has included knowledge exchange workshops in Kisumu (2017) and Cape Town (2018), with Sheffield due to host the next of these international meetings in October 2019. The project will continue until at least the end of 2019, and the findings will be used to feedback to ongoing UN revisions of SDG targets and indicators. a series of 'City Briefs', which give an introduction to the case study cities and how they have started to engage with the SDGs, including the UN's recommended Tier 1 infictaors for Goal 11 on Sustainable Cities and Communities. an evidence submission to the Environmental Audit Committee's follow up inquiry on the Sustainable Development Goals in the UK (September 2018), based on our learning from international partners about how SDG localisation can be supported and enabled. The Sustainable Development Goals (SDGs) form part of Agenda 2030 for Sustainable Development, a global agenda for sustainability adopted in 2015 by the UN General Assembly. The SDGs replace the Millennium Development Goals and are for all countries regardless of their level of development. There are 17 Global Goals with various associated targets and indicators, that together focus on ending poverrt, protecting the planet and ensuring prosperity for all. 193 countries - including the UK - have formally adopted the SDGs and are required to report on progress over the period 2016-30. Goal 11 focuses on Sustainable Cities and Communities and aims to make cities and human settlements inclusive, safe, resilient and sustainable. This has led to a greater focus than in previous UN initiatives on the importance of city-level actors and efforts to localise the SDGs. The New Urban Agenda (NUA) was adopted at the Habitat III summit in Quito, Ecuador, in October 2016 and formally adopted by the UN General Assembly on 22 December 2016. The NUA sets out a vision for sustainable urban development and is the guiding document for the UN's urban engagements over the next 20 years. Although, for political reasons, there is no formal link between the NUA and the SDGs, there is widespread consensus that the SDGs, especially Goal 11 and the urban elements of the other goals, should constitute the de facto monitoring and evaluation framework for the NUA. Mistra Urban Futures undertook a comparative pilot project in 2015 to test potential targets and indicators for the Urban Sustainable Development Goal (Goal 11). The pilot tested the data availability, relevance and appropriateness of the draft targets and indicators for Goal 11. This was carried out in the four citties where Mistra's Local Interaction Platforms are based: Cape Town, Gothenburg, Greater Manchester (now Sheffield-Manchester) and Kisumu, as well as in Bangalore as a contribution to the Urban SDG Campaign, of which the Centre was a member. A key conclusion of the pilot study was that if Goal 11 is to be a useful tool to encourage local and national authorities to make positive invesments in urban sustainability transitions, then it is vital that it should prove widely relevant, acceptable and practicable. In this diverse set of cities, the pilot study found that not one draft indicator was regarded as both important or relevant and easy to report on at city level. Based on these results, a set of recommendations was produced, which were taken up directly by the UN statistical team in UNDESA (United Nations Department for Economic and Social Affairs) in charge of finalising the targets and indicators. Some of these recommendations are reflected in the final version of Agenda 2030 adopted by the UN General Assembly. 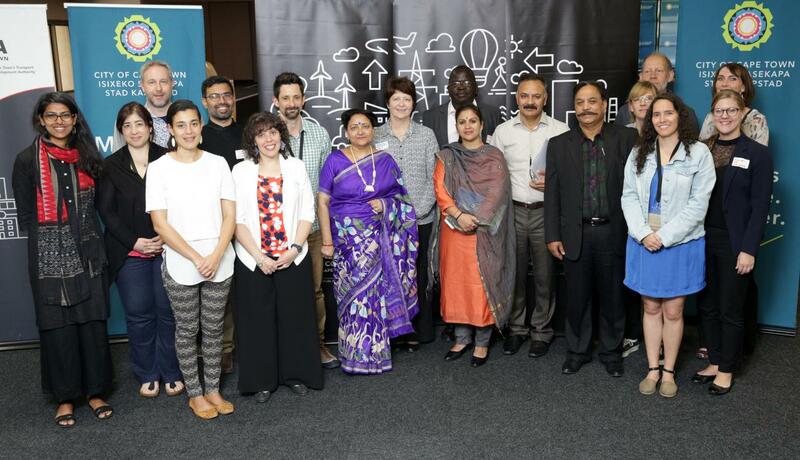 The international project team is led by David Simon and Sandra Valencia, and also includes researchers Sylvia Croese, Kristina Diprose, Aishwarya KS, Joakim Nordqvist, Michael Oloko, Tarun Sharma, Nick Taylor Buck, Ileana Versace and Yutika Vora, together with city partners. Locally, the work in Sheffield is overseen by Realising Just Cities Director Beth Perry. Kristina is a Research Associate at the Urban Institute and within the Sheffield-Manchester Local Interaction Platform. Her current research projects within the Realising Just Cities research programme focus on what 'just' sustainability means for Sheffield and local implementation of the UN Sustainable Development Goals. Her recent research and publications have focussed on: urban residents' views on intergenerational justice, consumption and sustainability; media representations of sustainability; local narratives and moral geographies of climate change; and intergenerational community-based research. She has an MA and a PhD in social geography from the University of Leeds, where her research focussed on voluntary sector ethnography and youth participation. Before joining the University of Sheffield as a postdoc in 2015, Kristina worked for The Young Foundation's 'Socially Sustainable Leeds' project, which combined ethnographic research and community organising.